July 1942. "Rupert, Idaho. Former CCC camp now under FSA management. 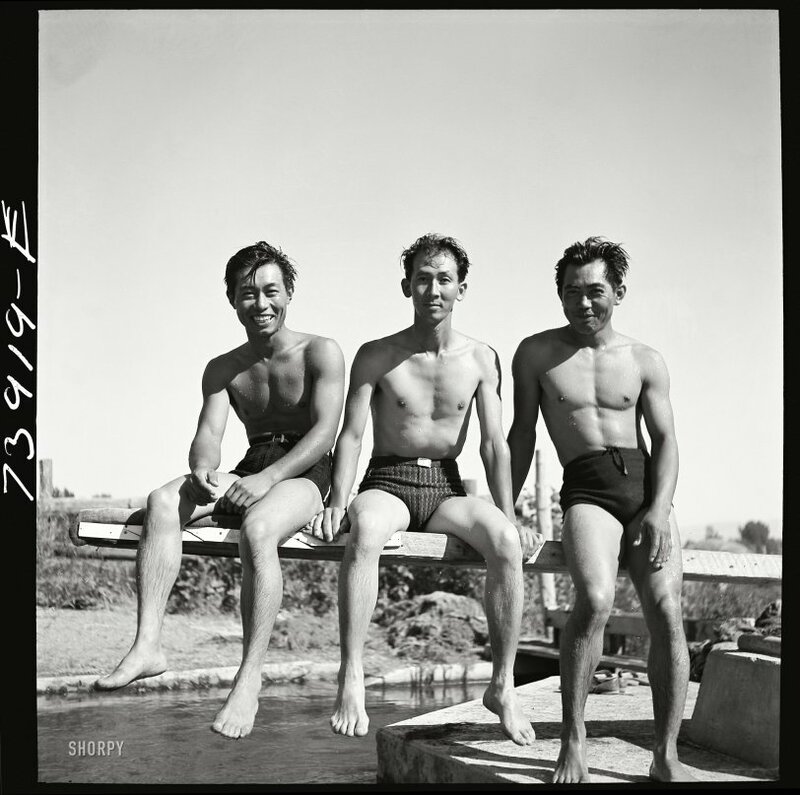 Japanese-American farm workers swimming." Medium format nitrate negative by Russell Lee for the Farm Security Administration. View full size. Submitted by Anonymous DC Tip... on Mon, 04/23/2012 - 8:27am. Finally some bathing beauties I can appreciate. hubba hubba! Submitted by A Californian on Sat, 04/21/2012 - 10:11pm. A former Japanese American co-worker said that from her personal experience once people arrived at the internment camps friendships were made and people generally made the best of a terrible situation. She said she met her future husband while there and that her family was able to buy a few simple comforts of home from the Sears and Montgomery Ward catalogues. Many of the San Diego children regularly corresponded with Miss Breed, a kindly downtown librarian who later published some of those letters in a book entitled "Dear Miss Breed." She remained close to some of those former children the rest of her life. Submitted by deefer on Sat, 04/21/2012 - 1:57am. despite being interred for no real good reason. I wonder if they were asked to smile for the camera. Submitted by loribl on Fri, 04/20/2012 - 12:52am. The an on the left could be a relative of George Takei. He spent time in an internment camp as a child. Submitted by pattyanne on Thu, 04/19/2012 - 10:19pm. Hard to be happy when your family is interned for no other reason than being Japanese. Unless I have my facts wrong. Good photo though! !